At the turn of the century this congregation began meeting in the Odd Fellows Hall in Halletsville, TX--20 miles south of Schulenberg. Jews from the surrounding towns, Flatonia, La Grange, Columbus, Weimar, etc., would come in for holidays and simchas. 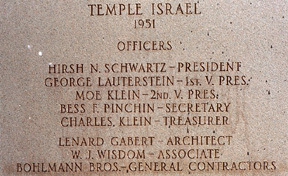 As life returned to normal after WWII it became apparent that the locus of membership had moved north, and it was decided to build a new building in Schulenberg. The architect Lenard Gabert (Baytown, Wharton) was engaged and the building was dedicated in 1951. The necessity for natural ventilation mandated a rational, no-nonsense scheme. The basic elements--social hall, sanctuary, entry, kitchen, office, and classroom--were disposed in the classic pre-war fashion, albeit in a zooty package. The main hall is divided by a folding partition into a fixed-seating area and an unencumbered area. Behind the ark are a small classroom and office and flanking the social hall are the entry-utility area and the kitchen-restroom area. Decoration is simple and the whole is airy, light, and altogether pleasant. Twenty-two head of cattle currently graze on the Leslie and Sarah Lipman farm just outside of town. The family has always lived in town but come out every day to tend the stock. The farmhouse remains without electricity or indoor plumbing. Mr. Lipman drags out a bale as a mid-day treat for the herd. Leslie's grandfather and later other Jewish families lived upstairs working in the store below. Later the Lipmans moved to more substantial retail quarters, selling soft goods for seventy-seven years before retiring in 1988. Schulenberg, settled by Czechs and Germans, is though small an enterprising place. Among the notable manufacturers is the Victor Stanzel Co. makers of flyable model airplaces since the '30's. One of the original Stanzel brothers still designs new models which are manufactured and assembled in a lovely Art Deco "moderne" factory. 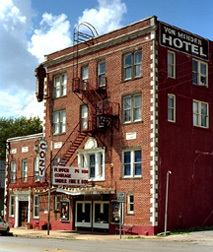 The Von Minden Hotel and the Cozy Theater below have been serving the town for many years. Visiting rabbis and their families imported for the holidays have often stayed here. Though crumbling around the edges the small-town, period charm is intact.